By the children of Lura, Nepal…. On the last day of our community project, we spent the morning playing with the children at Manju Shree Primary School. They loved having their photos taken and were fascinated by my camera so I slung the camera around the first child’s neck, showed him how to push the button to take a photo and let him go. And then child after child after child. These are the photos they took of their friends crowding around to have their photos taken. They’re better than mine! Enjoy the slideshow. The village may be physically located in a poor area of Nepal but the residents now include people from Australia, New Zealand and Scotland. 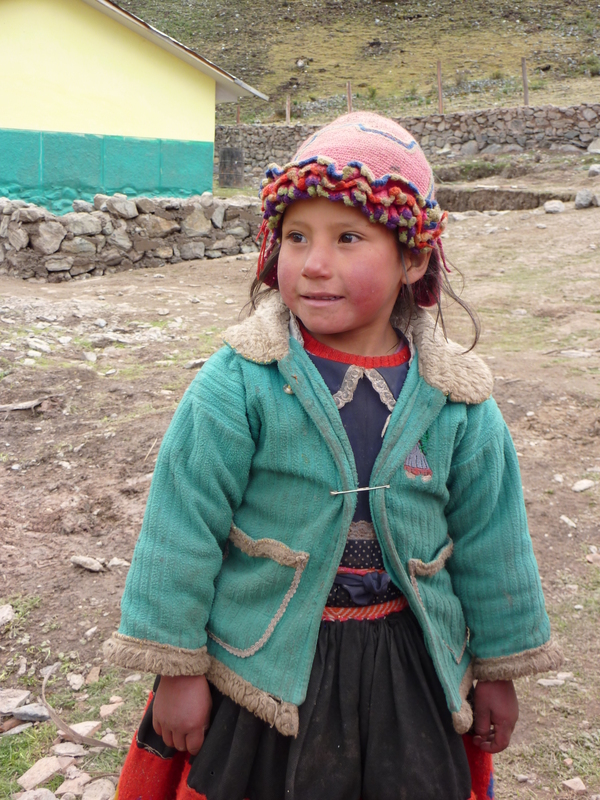 I’ve just recently returned from a Community Project trip to Nepal with World Expeditions. It was an opportunity to help in the post-earthquake rebuilding of one small corner of Nepal unlikely to receive government help. Seven Aussies, one Kiwi and a couple of resident Scots (actually, Sheila is Irish and John is English but they live in Aberdeen) dug, picked, shovelled, carried, hammered, pulled, shaped, bent, chipped, cut and ran their hearts out for nine whole days to provide a solid foundation to a new school building in the village of Lura, Lower Solukhumbu, Nepal. The Lura School Project Team – Sheila, Emma, Pic, Jenny, John, Simon, David, Heather, Judy & Carolyn. For the warm welcome we received from the school and wider community. The children waiting to offer us prayer scarves and marigold garlands on our arrival at the school. For sunny days and the satisfaction of hard work. Digging out the foundations with picks and shovels. Oh, for a bobcat. Bending rebar into squares for the concrete pillar frames. With a few nails and a bit of pipe. For the things we take for granted back home. Like a truck full of gravel. The Rock Chippers. Making gravel with rocks and hammers. Or for the easy availability of supplies. Hammering nails out of wood to be reused. With a rock. A bucket full of nails pulled out of all the wood and ready for straightening and reusing. How do you get the rocks from down the hill to the school? For the smiles and fun of children. For the fulfillment of achieving more than expected. Our trekking crew successfully jerry-rigged a powerboard and electric light in the dining tent, feeding off a line from a nearby house. Yes, I know what you’re thinking. As were we. I’m getting to that. There was silence around the table. I think all of us were deeply moved and felt both proud and humbled. The people of Lura have so little and we were the ones to be thankful for the opportunity to do such a simple thing to help them. Sherpa people offering thanks with a song and special drink of raksi. The look on my face is because I was trying not to cry. In a physical sense, we have changed the world of the community of Lura and the children of Manju Shree Primary School, helping them on their way to a new and sturdy school building. More importantly, however, our own worlds have changed in ways we are still discovering. We may never see our lives in quite the same light again. And a part of us will always be living in a small village in Nepal. In the wee hours of Saturday morning, I will board a Flying Metal Bird for parts unknown. Well, unknown to me. 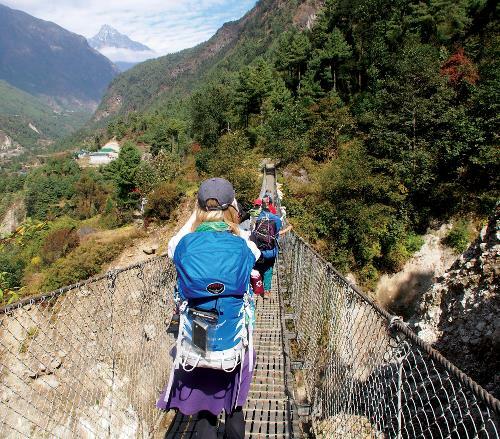 I’ll be gone four weeks – three in Nepal and one in Bhutan. I will not be gracing the blogosphere for much of the journey (if at all). For the ten days I will spend in the village of Lura followed by the six days of trekking in the Lower Solukhumbu region, I anticipate a lack of access to electricity. Forget about internet. The week in Bhutan will be on a more civilised standing (in that I’ll be sleeping in a bed rather than on the ground and the toilet won’t be a hole in the ground) but I suspect I will have better things to do with my time than surf the WordPress wave (no offence). The school has been demolished and work has begun on the new building. The first group from World Expeditions has already started on the foundations and we will pick up where they leave off and groups will come after us to continue the work until it is done. Bhutan? Well, that’s just for me. It’s been top of my bucket list for years so when The Husband told me to take more time if there was something else I wanted to do while I was in the area, I took him seriously. Called “The Essence of Bhutan” this private tour will be just a taste of this fascinating country. It’s not private by choice but no one else booked for that date. I will have my own one-on-one guide and driver for the eight days I am there. Introvert Me is hunched in the corner breathing into a paper bag. I am nervously excited for the adventure ahead. Traveller Me can’t wait to get there but Shy Me – whom I usually manage to keep busy in the kitchen during parties – keeps sticking her head out the door with questions like, “What if they don’t like you?”. I’m trying to ignore her. NOTE: If you can’t wait four weeks, fairly regular updates on the project are available here. You might even be able to spot me in a photograph if you’re really lucky. 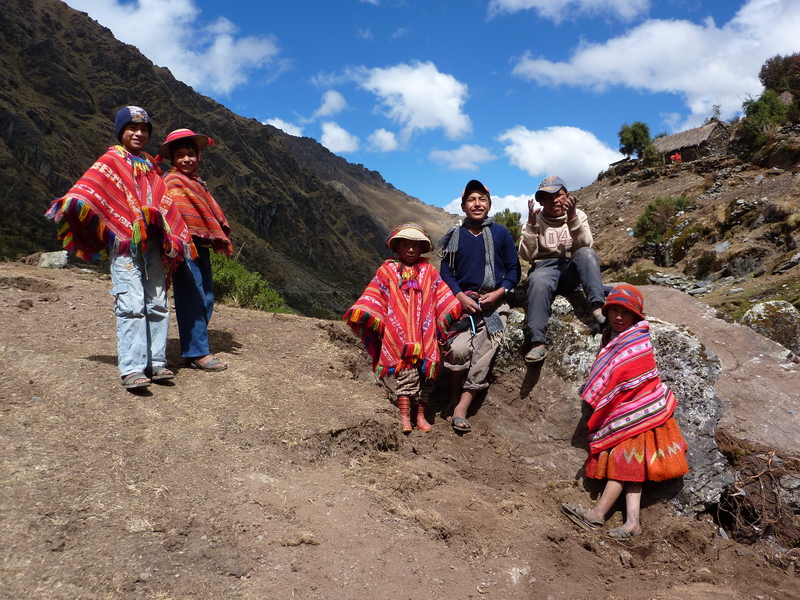 In 2009 I participated in a Community Project trip to Peru with World Expeditions. It was one long experience of perspective. Being there in the dry season, the river was little more than a creek but when the water comes, it can be a raging torrent. 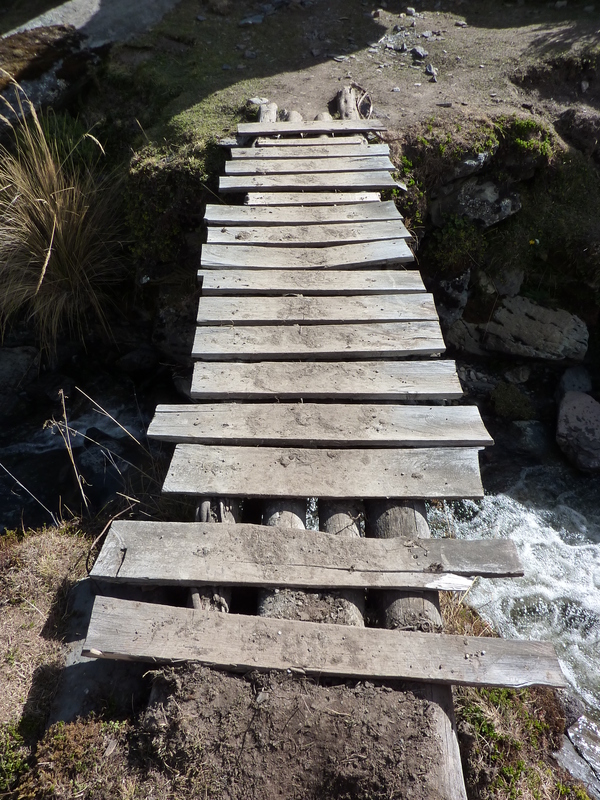 I don’t know about you, but I wouldn’t want my children crossing a fast-flowing river on this bridge. 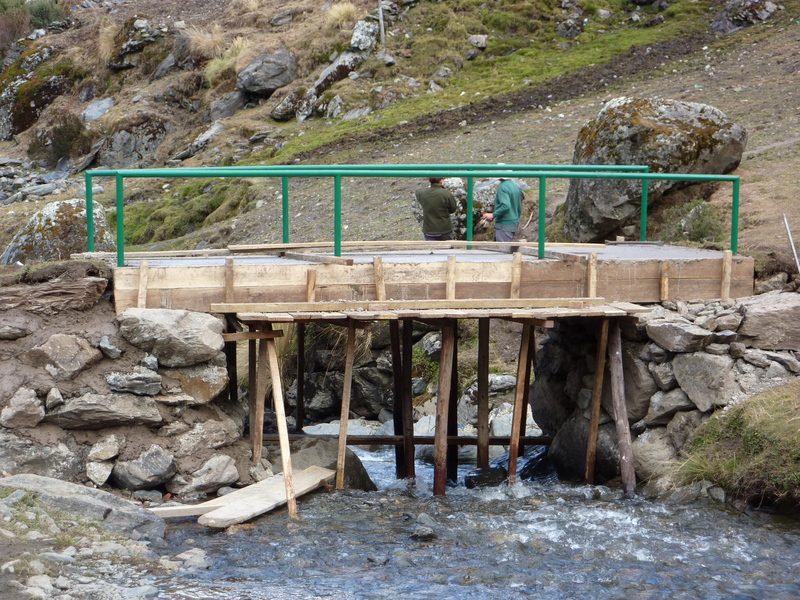 When completed, we held an official opening and blessing of the new bridge and celebrated with the villagers. We had brought supplies for the school and some of these were handed out to the children as gifts. Excitement as gifts are handed out. This was my strongest lesson in perspective. 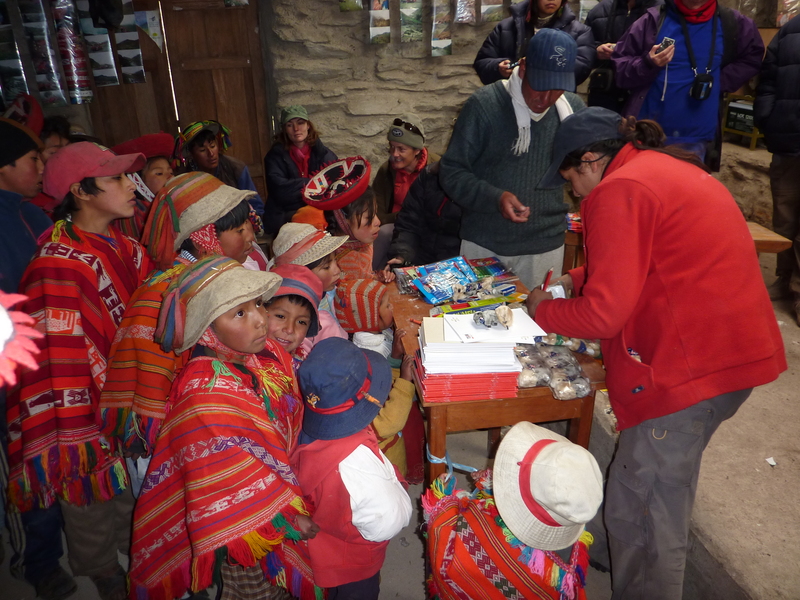 The children were so excited to receive a pad of paper and a few pencils. When you live in a stone hut with a dirt floor and no running water, when your toys are the sticks and stones outside your door, some shiny new paper and sharp pencils all of your own must seem like a treasure bounty. When I returned home, so many people greeted me with “Welcome back to the real world.” If only they knew. I had actually left the real world and come home to Fantasy Land. For weeks after I returned, I couldn’t even sit with other parents waiting to pick up their children at school. The complaints of “Susie’s gymnastics teacher just doesn’t understand her” or “Johnny isn’t getting enough time on the basketball court” left me with an overwhelming urge to grab the parent by the shoulders and yell, “Get a grip!!”. I shamefully admit that I did acclimatise back into Fantasy Land eventually and even now I find myself complaining of similar trivial issues. However, I am regularly reminded of my experiences in Tastayoq. On our trek to the village, we had pretty extreme weather. One day it rained so much I got wet right through my coat and three layers of clothing. Now, every time it rains, I remember that experience. It brings first a feeling of exhilaration (I loved our time trekking even when it snowed) then a reminder of the Tastayoq children. And I get a grip on my problems and remember how lucky I am.